The euro vs dollar ended the week with a wide spread up candle which promptly reversed all of Thursday’s losses and has given us a bullish engulfing signal to start the trading week. However, with little fundamental news today to excite the markets it is unlikely that we will see any validation of this signal until later in the trading week but, if confirmed, then we may expect to see the euro vs dollar struggle higher as it begins a short squeeze to re-test the USD1.38 price handle initially. Any longer term rally will require significiant momentum which given the fundamental background seems unlikely at present so the next few days should be seen as opportunities to open further short positions during this short term rebound. 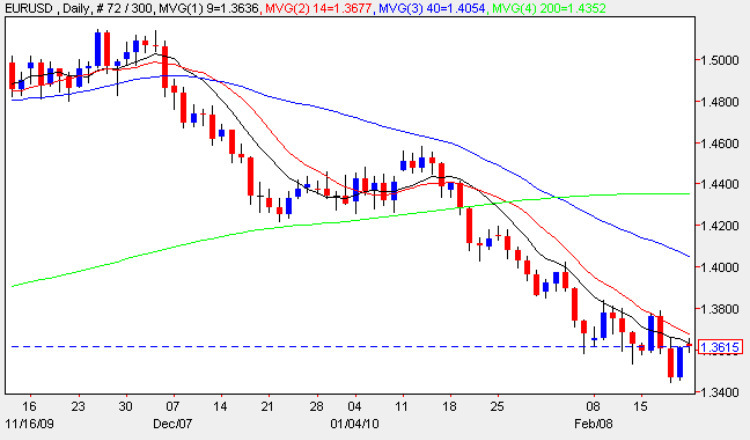 With all three moving averages still weighing heavily and with the 200 day now beginning to turn the longer term outlook remains firmly bearish with USD1.30 a possible interim target and potential platform of support. This week’s fundamental news items for both euro and US dollar can be found on my blog. A weekly forecast for the pair is also available here.